At first I thought I was not going to partake in any of this New Year's Resolution stuff, both in real life and my quilting life. I prefer to live every day to the best of my ability and not be afraid of new things at any time of the year. And quilting and crafting, well, I just don't need the self imposed pressure. Then I started thinking about my growing stash, and items I have recently ordered and I decided I better focus myself!! Each of the items I plan to create are exciting to me, so I hope to enjoy the process. My first new project of the year is my embroidery, this will become a mini quilt for me. I am not sure how it will evolve, I am taking it one step at a time. 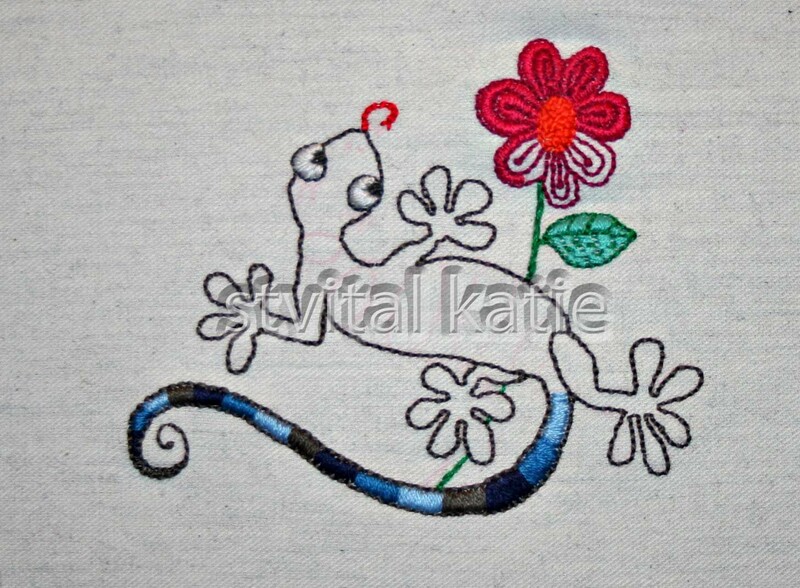 Last month I decided I would embroider a heart, then flowers, then I wondered what they really symbolized to me and in the end I chose a lizard. A lizard may seem unconventional to some, but I used to have a 'thing' for lizards and during that phase I tattooed one on my ankle! I also painted a lizard in every room of my first house. Some rooms it was visible, other rooms it was hidden. I am sure the people who bought the house thought I was crazy when they discovered them all. I don't have any in my current house. Maybe I should add one or two? I have seen a lot of lizards drawn similar to the one I drew, but it is not a copy of any particular one. I drew the pattern on paper, then used a transfer pencil to transfer it to my fabric. Thread is different to work with than pen, so I changed my flower slightly to work with the embroidery floss. I have also changed my original plan for the tail and am still undecided on how to fill in the body. Here is a list of my 2013 prospects (I will not guarantee any of the following finishes, because I tend to get distracted and start new projects - but I promise myself to try and make them my priority, one at a time). 6. Lark Kaleidoscope quilt :: fabric's stashed away, just need the courage to start it. 7. Fleece Slippers for me :: I made one in November - I must make the second one. The biggest thing standing in my way right now, I have no sewing machine! It is in the shop for the second time in under two months. I am currently shopping around, trying to decide what I want. In the meantime I am picking up my Mom's tomorrow. She is letting me borrow it for a little while. I cannot wait to try it out. this week guest hosted by Heidi at Buttons and Butterflies.